In front of what was comfortably Parkgate's highest home league crowd of the season, swelled by a couple of hundred groundhoppers, who were attending the NCEL's Easter Hop event, Staveley returned to winning ways, with a hard working and resilient performance against a home side who's defence had been well drilled and in a determined mood on Saturday afternoon. The early kick off and above average attendance tucked into Parkgate's two sided ground, made for a surreal atmosphere as the two sides set about trying to unlock each other's back line. 'The Steelmen' set out their stall and swamped the final third with bodies, to nullify and stifle Staveley's attacking threat by crowding them out - and it worked, to a point - in the opening half. They worked really hard to repel the visitors attempts to break the deadlock, which proved to be Steve Adams' side's downfall in the long run, as the younger and fitter Welfare players over-ran their tired hosts in the final fifteen minutes. Staveley started well and had a great opportunity to open the scoring inside the first ten minutes, when Ellis Wall shot across the face of goal, but his effort flew wide of the far post. 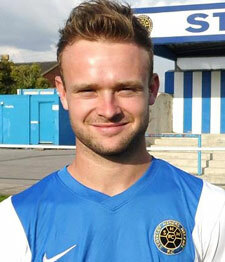 James Ashmore's distribution with a succession of free kicks from the middle of the park, saw him finding a team mate in the hosts goal area every time, but Parkgate saw to it that any danger was thwarted by congesting their twelve yard box and allowing Staveley no room to manoeuvre. In the 25th minute, Jordan Hodder hobbled out of the action. Sadly he wasn't the only Welfare player who had to go off over he course of the game, with Jack Poulton being withdrawn at half time and Brad Jones limping heavily away to the dressing room on 70 minute. the latter tweeted later: "Back to winning ways! Anybody got any hamstrings for sale?" 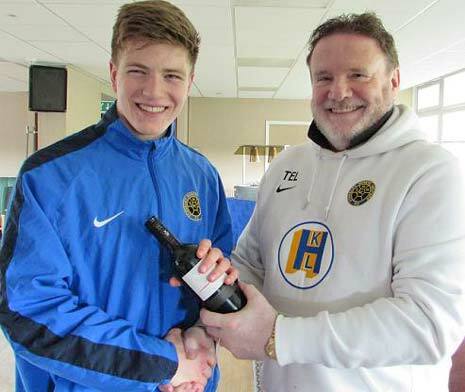 17 year old Alex Pugh, Staveley's Man of the Match, (above),was showing maturity beyond his years and instinctively knew how to get himself into the right place at the right time, to intercept Parkgate's attacking intentions and distribute the ball to good effect. Staveley's development team coaches have unearthed a real gem! 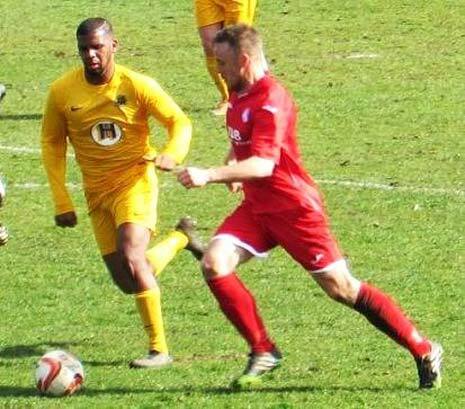 Ellis Wall dispossessed Alex Varley near the half way line, advanced forward and threaded a pass through to Jahmal Smith (above), but as the prolific front man lined up to shoot, the Parkgate defence crowded him out again. Ryan Watters fed the ball out wide to Jones who dribbled into the area, but the 'Steelmen' threw extra bodies into his route to goal and Staveley were denied again. Ross Goodwin took a quick throw in out on the right to James Ashmore, who shot first time from 20 yards, but didn't get enough power behind the ball and Jamie Bailey was able to gather the ball with ease. Just before the break, as Parkgate shut their doors once again to bring a frustrating half for the visitors to a close, Jonathan Wragg struck Watters in the face with his flailing right arm, but it was on the referees blind side and Mr Dwyer was unmoved as even the neutrals among the crowd called foul play. Match officials can't have eyes and ears everywhere and they will miss the occasional transgression, but Wragg was lucky to have got away with this particular one. After the break, as Staveley pondered their options as to how they were going to make a breakthrough against a steadfast and determined Parkgate defensive pack, they were dealt another problem to contend with when Adam Stapleford-Jones saw off the attentions of Brad Jones and Alex Pugh, before wrong-footing Steve Hernandez and rolling the ball into the net just inside the left hand post. 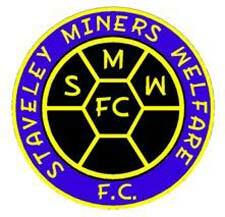 Having suffered three back to back defeats, morale was low in the Staveley camp for a variety of reasons. But while it is easy to ride on the crest of a wave when things are going well, it is at times like this that managers really earn their stripes and find out what their players really have in their reserve tank. The Welfare lads went on to show they had plenty. Ashmore's long free kick into the box was nodded back by Goodwin into the path of Wall, but with challenges flying in, he didn't have time to settle and his rushed shot went wide of the left hand upright. Sam Finlaw won a 50/50 ball in midfield and sent Smith racing away who quickly laid the ball off to wall, but his ever present markers swooped again and suffocated another Staveley attack. The away side had the scent of goal in their nostrils and were hell bent on getting back into the game, but Parkgate countered and Stapleton-Jones nutmegged Goodwin before unleashing a thundering shot from the left hand side of the box, that Hernandez turned away sublimely. Ashmore played a short corner to Wall out on the left, his cross was flicked on by Smith into the path of Watters who thumped home the equaliser from just inside the Parkgate box on 62 minutes (see video below). Staveley were in the ascendancy now and they stretched the home side's defence to breaking point. 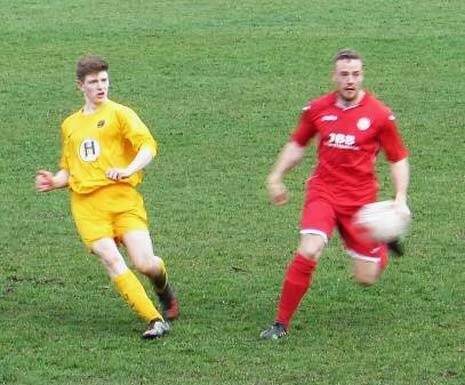 Jones, Watters, Ashmore, Wall and Finlaw, had seemingly now found the key to unlock Parkgate's stubborn rearguard and they were pushing on for all three points. Ellis Wall's (pictured left), right wing cross found Brad Jones on the penalty spot, but he took a knock from behind and pulled up in pain as his effort deflected wide of the goal off a defender. Watters was clattered again in the centre circle, this time by Ryan Johnson, but Finlaw's long free kick evaded everyone in the goalmouth and went behind for a goal kick. Staveley thought they had finally taken the lead that they so richly deserved, when Wall unleashed Ashmore, who's shot was parried only as far as Smith, Bailey saved twice from the Welfare number 9 before the ball was only half cleared as far as Finlaw, who crashed a thumping shot against the woodwork. But there was more to come - with just three minutes remaining, Wall found some space for himself and got his shot away, Bailey blocked it but the ball fell to Smith who wasn't going to be denied this time and he struck the ball beyond the stranded keepper to claim the victory fo Staveley. Both sides had chances in the dying moments of the game, Pugh got in a last ditch saving tackle as Johnson cued his shot up and back at the other end, Smith pickd his way past two challenges but skied the ball over the bar. When the going gets tough! A battling win to see off the vultures who have started circling to pick over the bones ... there is still a lot of football to be played this season. 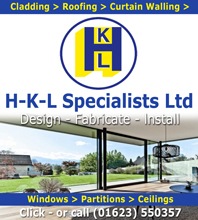 Staveley are at home on Wednesday 8th April, when they face AFC Mansfield (from Forest Town) for the first time ever, in a League Cup Quarter Final tie, when they will vye for a home Semi Final game against Handsworth Parramore (who play in nearby Worksop). Next Saturday, 11th April, the Welfare travel to Armthorpe Welfare, when normality returns to the NCEL fixtures calendar - and the game will kick off at 3pm.